Collector, Michael Aldrich unboxes the 12in Series Godzilla 1992 by X-Plus. This is the North American reissue of the Toho 30cm Series Godzilla 1992 and is the same in most every way. You can see more of Michael’s videos at his Youtube Channel. Leslie Chambers reviews the Toho 30cm Series Yuji Sakai Modeling Collection Godzilla 1992 vinyl figure by X-Plus. KaijuRob reviews the Toho 30cm Series Yuji Sakai Modeling Collection Godzilla 1992 vinyl figure by X-Plus. On top of this excellent review, he addresses sore points to this figure which other collectors have complained about and explains why it’s actually one of the best. 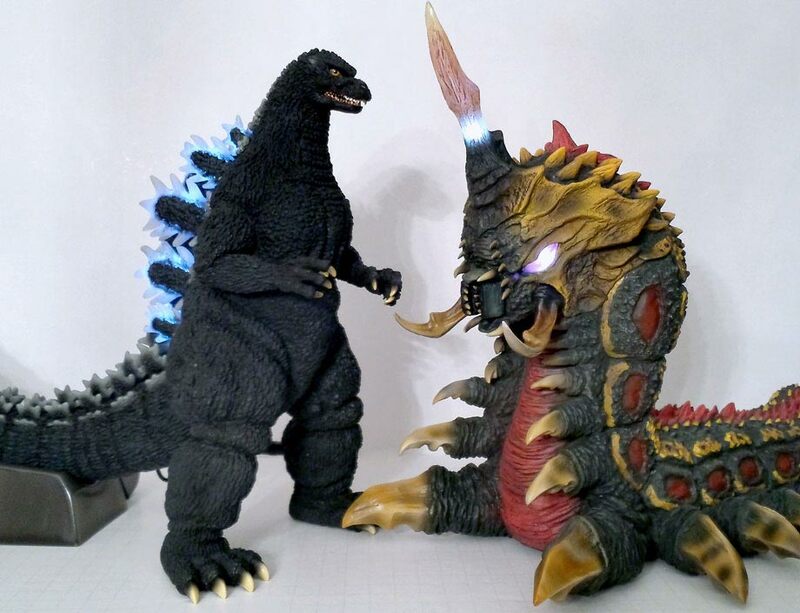 Rich Eso reviews the Toho 30cm Series Yuji Sakai Modeling Collection Godzilla 1992 東宝30cmシリーズ 酒井ゆうじ造形コレクション ゴジラ1992 丹沢進撃. Here is my review of the X-Plus Toho 30cm Series Yuji Sakai Modeling Collection GODZILLA 1992 (Tanzawa Advance) with product pics. This is specifically for the RIC edition which features light-up dorsal plates. There has been controversy surrounding the quality of this figure due to many of the photos being posted online; hopefully some of these concerns may be cleared up now because much of it seems to be unwarranted after seeing the actual product. 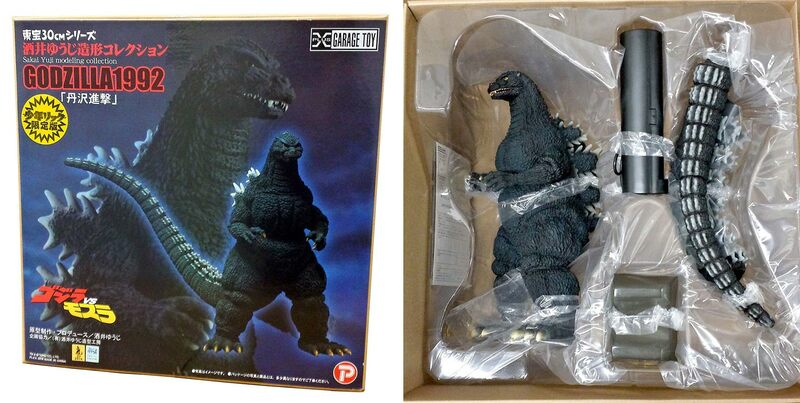 Godzilla ’92 comes packaged in the typical X-Plus blind box with illustrated label affixed to the front, common to the Yuji Sakai modeling collection. Each box has also been packaged within its own sturdy shipping carton, which is really helpful. Inside, the figure has been well secured to the plastic tray and protected for transit. The tail (in two separate sections), tail base and power supply unit are all packaged separately from each other. X-Plus receives top marks for its packaging here, which has been done to minimize any damage to this expensive figure. The figure is molded in charcoal gray with the only painted areas being the eyes, mouth, nails and dorsal fins. There is also a light spray of pink in the nose and ears. All of the figures that I inspected had uniform paint on the facial features, without any significant deviation. The completed figure represents the original sculpt very well, which is classic Yuji Sakai. In 12-inch size, he has expertly interpreted the details of a 6-foot monster suit which was fashioned to appear hundreds of feet tall on screen. Some collectors have commented negatively on the stance and arm positioning, but these are clearly indicative of the suit actor’s portrayal. Looking at this figure, you can almost envision Kenpachiro Satsuma toiling away inside of Godzilla in order to give the character life. The tail when assembled gives the figure a total overall length of about 17 inches, and the supplied tail base must be utilized for the figure to stand properly. The RIC exclusive light-up dorsal feature is activated via a connection at the back of the leg. 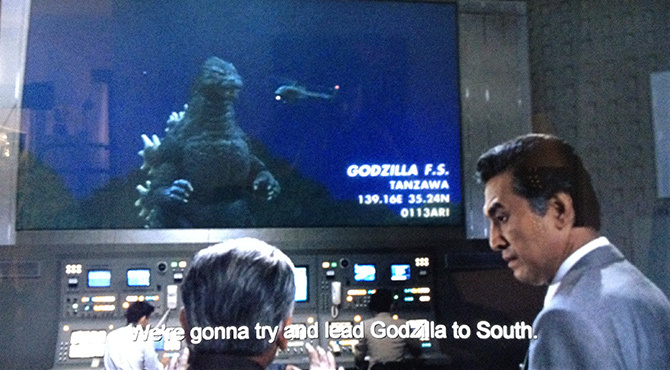 It’s a strong effect, and recalls the scene when Godzilla first surfaces from the ocean in the film. Do not compare it to scenes which have optical enhancement or you’re likely to be disappointed. I believe it’s the advance product pics which have caused the most controversy. The official X-Plus images show a darkly-lit figure, indicative of the Tanzawa attack sequence in Godzilla vs. Mothra. The sample figure has also been dry brushed in light blue to bring out the detail of the sculpt. The actual product is not painted in this fashion and so the vinyl color makes it very difficult to photograph from many angles. In flat lighting, the minor gloss of the vinyl picks up reflections that look like inconsistencies in the coloring. Viewed from different angles, the highlights can look like white flecks on the figure. The light spray in the ears and nose has also been a problem for many, but this is a design choice and not a quality control error. And, since the product pics do not show this, certainly there will be some disappointment among collectors as to why it was added. In addition, there has been concern that the figure’s legs look too thin. X-Plus’ pics seem to show a more hefty and squat figure, but this is simply a trick of the dark lighting and black background. When the same pics are brightened, the sample figure’s sculpt appears identical to the final product. 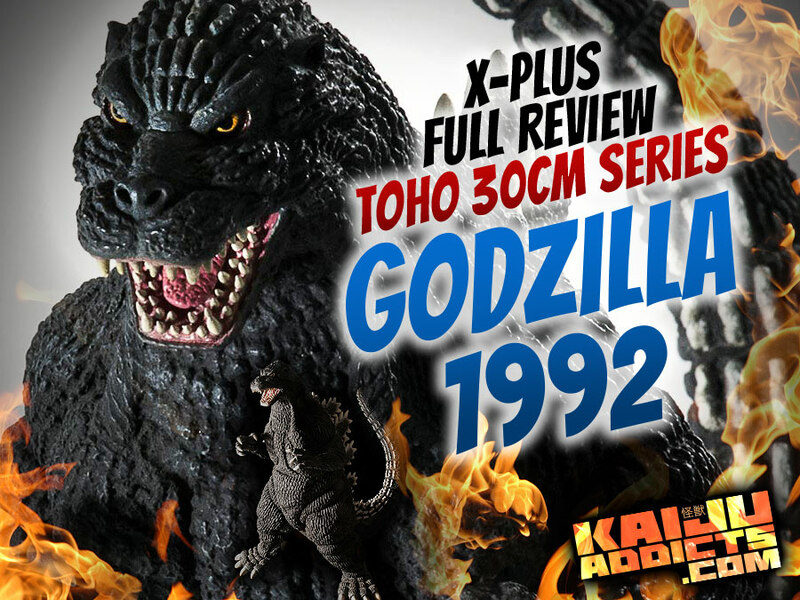 Overall, the X-Plus Yuji Sakai GODZILLA 1992 receives a thumbs-up. For the price, I agree that this figure should be exactly as expected, without any need for the buyer to have to touch it up. On the other hand, the area that’s causing the most controversy — the face — is literally one inch in length. So unless your figure comes with an unpainted eyeball, it’s very difficult to label these concerns as a lack of quality control. The Toho 30cm Series Godzilla 1992 is based on the Heisei film, Godzilla vs. Mothra. X-Plus first released this figure in 2011, very early on in the modern run of accurate vinyls which had a slow start around 2009. 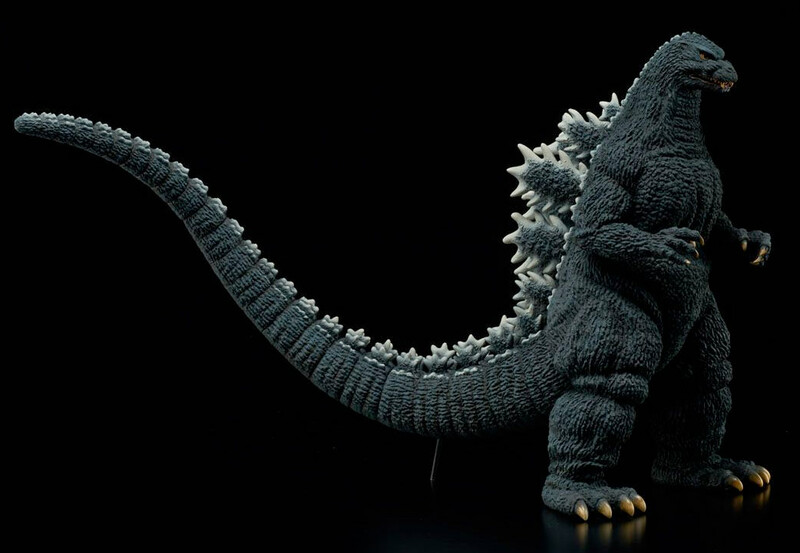 This was X-Plus’ very first Heisei Godzilla figure in the 30cm Series. I had to dish out $500 for this figure in the aftermarket back in 2013. But new collectors will get a way better deal than I did. This figure is known for not having the most accurate sculpt, but it does have other stellar qualities instead. Originally planned as a January 2017 Release, this vinyl badass will be here Next Month! This figure was originally assigned a January 2017 release. But in a move which may upset your planned budget, it’s been bumped up to November 16, 2016. That’s next month! 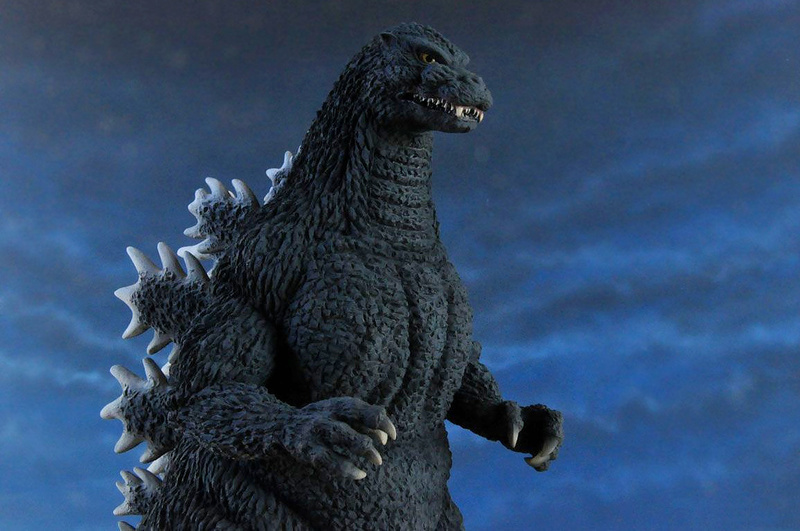 Note that the 12in Series Godzilla 1984 (1985) figure was already scheduled for a November 30, 2016 release. Does this mean there will be TWO new X-Plus figures tugging at our wallets? Could be. But, as Michael Cherkowsky of Vampire Robots pointed out, the ’84 may get pushed back to December. This seems likely since the ’92 is already on a cargo ship headed for the States, and the ’84 is not. 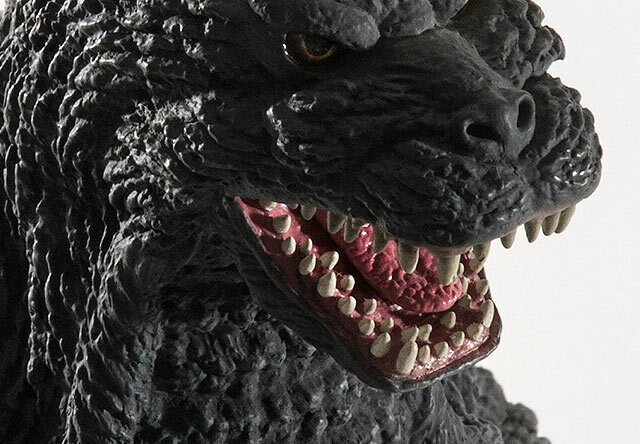 It’s possible that the release of this figure was pushed up to clear January for the newly announced Gigantic Series Godzilla 2001 Diamond Reissue which has a current release date of January 4, 2017. 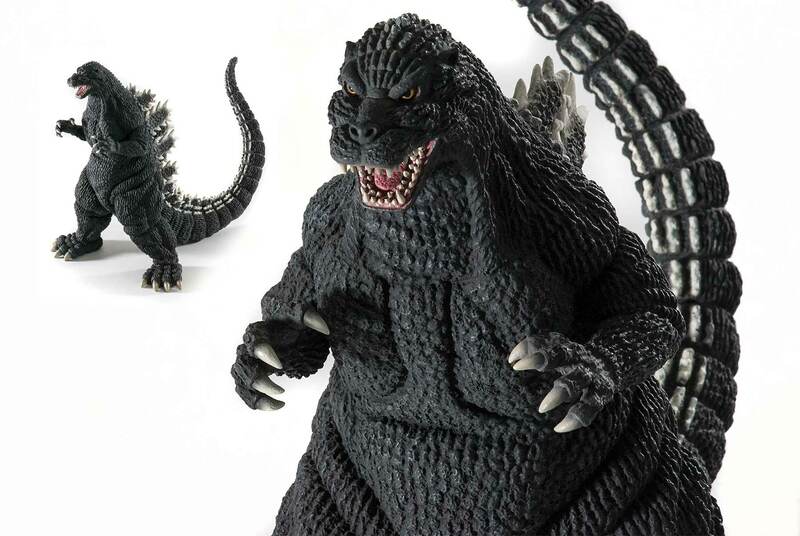 This change is also odd in that it will come out shortly before the newly announced shorter, yet more accurate Toho 30cm Series Yuji Sakai Modeling Collection Godzilla 1992 Japanese release expected in late November/early December. A 30cm Series Godzilla 1992 Review is in the works and will be released shortly. • Click here to Preorder the 12in Series Godzilla 1992 Diamond Reissue at Flossie’s Gifts & Collectibles for $139. • Or ask your local comic store about this figure or order from your favorite U.S. online retailer. 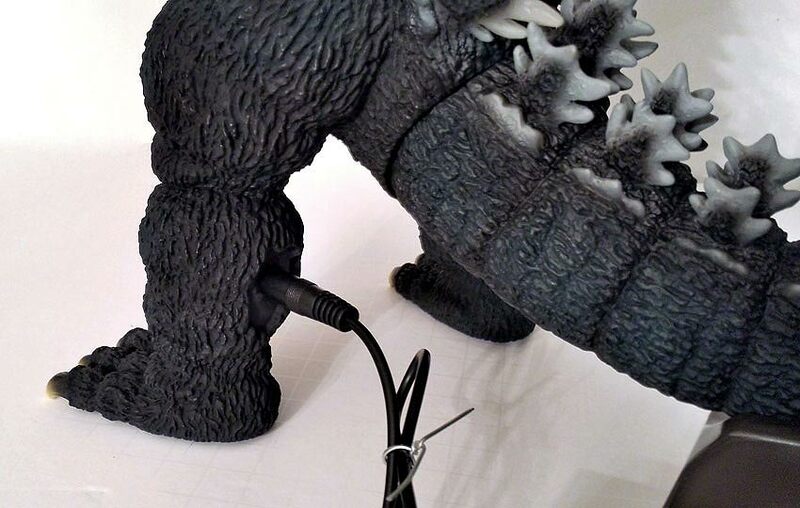 X-Plus and master sculptor Yuji Sakai are teaming up again to bring us yet another fantastic Godzilla vinyl. News of the Toho 30cm Series Yuji Sakai Modelling Collection Godzilla 1992 Tanzawa March (東宝30cmシリーズ 酒井ゆうじ造形コレクション ゴジラ1992 丹沢進撃 ) vinyl figure surprisingly broke first at Japanese retailer, Hobby Search. X-Plus’ Ric Boy site has yet to mention it. They have a page for it in the works; it’s just not ready to go live yet. This sculpt comes from 1992’s Godzilla vs. Mothra (ゴジラvsモスラ). As usual, Sakai sculpted this not only to fit the movie but a particular scene. After the first battle between Godzilla and Battra at sea, both are sucked into an underwater fissure in the Philippine Trench. Godzilla then swims up a lava stream and emerges from Mount Fuji. From there he marches over the Tanzawa Mountains (丹沢山地) to Yokahama and then finally to Tokyo where he resumes his battle with the big bugs. This new figure is posed to match a scene during Godzilla’s battle with Self-Defense Force tanks and masers in the Tanzawa mountains. If you have the movie on DVD, set it to play at 1 hour, 16 minutes. That’s the scene. Yuji Sakai’s original resin version of this figure stands 29.5cm but X-Plus’ vinyl version will be a bit shorter. They had to cast the prototype in wax in order to make a new mold. This process will reduce its height to about 27cm. Because of this, the figure will be a little short next to the Toho 30cm Series Battra Larva. But it should be fine as long as you’re not a scale freak like me. If you are, you’ll need to rely on the original X-Plus 30cm Series Godzilla 1992 for that since its a full 30cm. This is the second time X-Plus will put out a ’92. 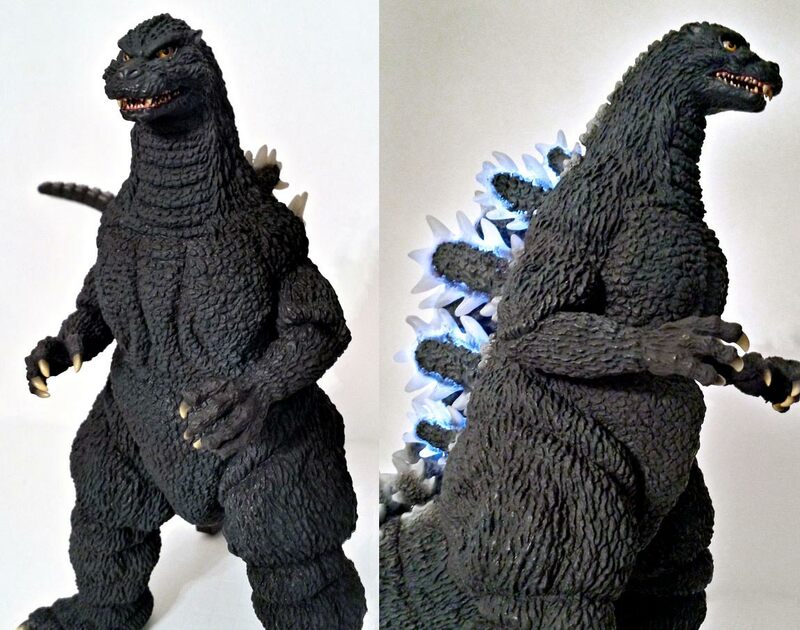 In 2011, they released their own sculpt, the Toho 30cm Series Godzilla 1992. A North American re-issue of this original figure is due to be released in January 2017. It’s much taller, and far less expensive ($139 at Flossie’s). But the sculpt is no match to the accuracy sculpted into the Sakai version. A number of collectors have already remarked that they felt this new Sakai ’92 is too similar to the Sakai ’91 which was released last year. 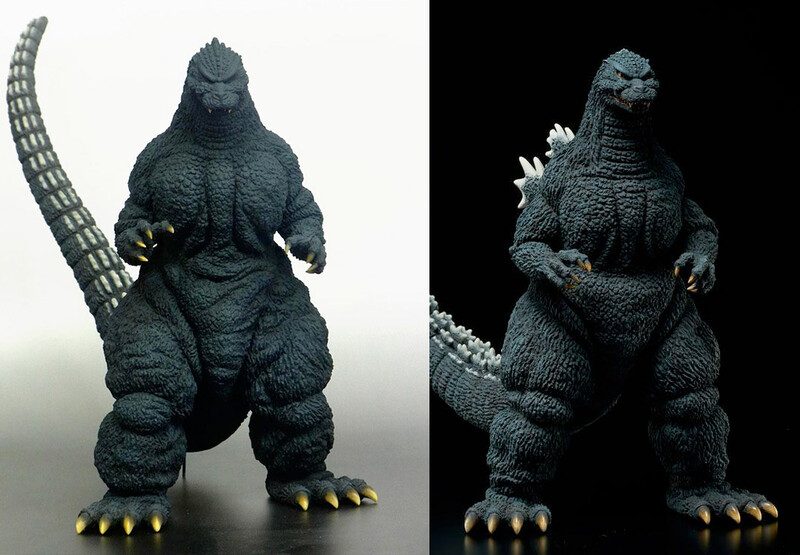 For the more casual Godzilla fans and collectors, I’ll point out some of the differences. The head angles are different. The chest on the ’92 isn’t as bunchy. The leg stances are different. The tails may seem similar, but they are noticeably different, especially from the side. The ’92’s tail doesn’t rise as high as the ’91’s. The front of the ’92 has a more segmented neck. Very significant from the side is the more natural progression of the dorsal fins on the back as they rise up to the head. On the ’91, there is a very abrupt “step” in this pattern. This is a classic example of X-Plus giving you more than you asked for or even think you wanted. These figures are super accurate and faithful to the designs of the actual suits, even in ways you didn’t know about. Hobby Search has the X-Plus Yuji Sakai Godzilla 1992 Standard Version up for pre-order at ¥23,750 ($233 USD). They say the figure is due for release in late November 2016. A Ric Boy (or Shounen Ric) version is up for preorder at X-Plus’ Ric Boy site. The figure will come with light-up fins and will run you ¥28,944 ($281 USD). Ouch! The preorder window for Rics closes on October 20, 2016 and you can expect your figure to ship in late November-early December 2016. You can order it here at the Ric Boy store. If you own a copy of the Godzilla Dream Evolution book featuring all of Sakai’s works, turn to pages 32 and 33. You’ll find a 2-page spread there with 3 photos of this figure. 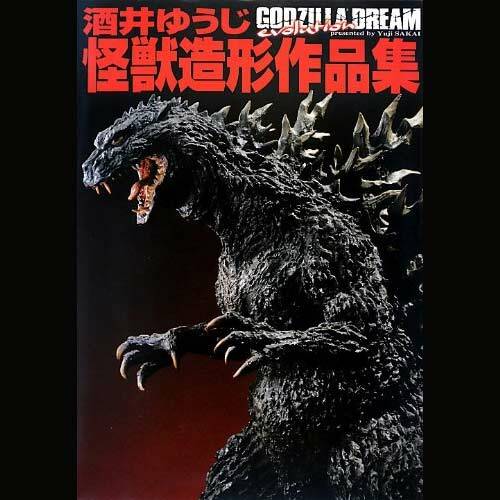 If you don’t already have a copy of Sakai’s Godzilla Dream Evolution hardback photo book, consider grabbing one. Any future X-Plus collaborations will be in that book allowing you to see the possibilities. Also, keep in mind the upcoming Yuji Sakai’s Work Masterpiece Art Collection coming soon from X-Plus, and from Bluefin here in the states! 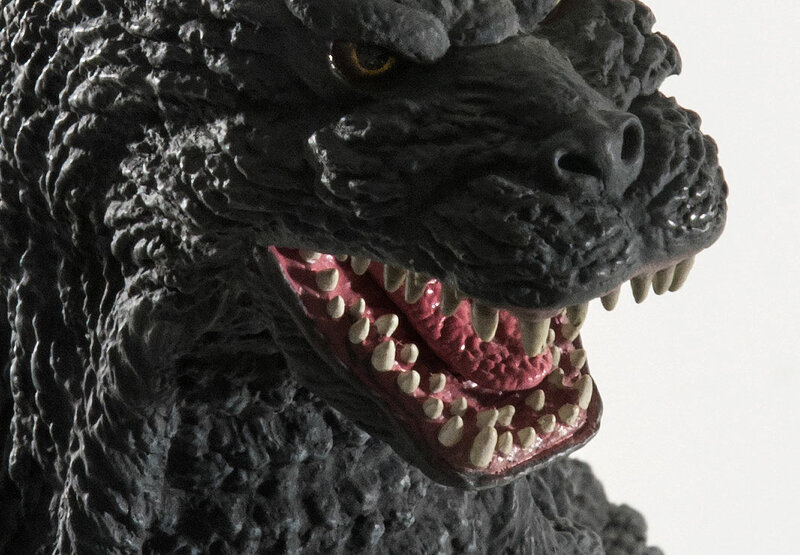 This new line will feature Sakai’s works based on Godzilla movie stills, posters and more. You can get a copy from Amazon for $46.38. We also have them ready to ship at Flossie’s for $44.99. Rich Eso reviews the Toho 30cm Series Battra Larva (東宝30cmシリーズ 「バトラ（幼虫）」) vinyl figure recently released by X-Plus.